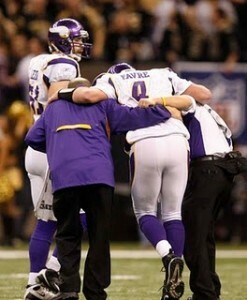 Favre was beaten and battered by the Saints. 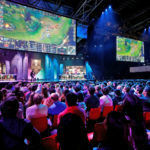 The popular question following the victory by the New Orleans Saints over the Minnesota Vikings to clinch the NFC Championship and the right to play in the Super Bowl has been, “Are you happy now?” Happy is not the word I use. Watching Sunday’s game I grimaced at every painful hit given by the Saint defense onto the Viking quarterback. Every tackle that was borderline late, I winced at. But each time the veteran QB got up off the Superdome turf and returned to the huddle. Every time but one, then he was helped off the field at the end of a possession. While watching the trainers and doctors of the Vikings checked him out and re taped his ankle, many wondered if he would answer the bell. But like a great title fighter he came back in to take his licks and fight his team one more time. But was I happy the Vikings lost? No, I was relieved. I was relieved that the one time QB of my favorite team, the Green Bay Packers wasn’t able to take the division rival to the Super Bowl. Throughout the year all Packer fans were expecting the “old” Favre to come back. We were waiting for Brett to begin forcing the ball, being intercepted and costing the Packers a possible victory. Green Bay fans would shrug it off as “Brett being Brett.” We felt that is what made him the QB that Packer fans fell in love with. But the divorce wasn’t pretty and eventually Brett wanted to prove to the administration of the team that he parted ways with that he could still play. He did take Green Bay to the NFC Championship game in his last year in Wisconsin just two years ago and he knew there were still many touchdown throws left in that right arm. 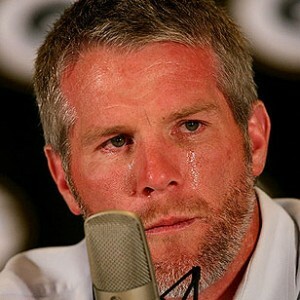 Will there be another tearful goodbye for Favre? But was I relieved that he didn’t take the purple to Miami and the Super Bowl? He did prove that he could still play at a higher level than anyone thought he could play. He is destined to be the league MVP for another time. Is it five? six? Packer fans know he earned the award every year for their team. And with arguably the best surrounding cast of his storied career, he proved to the Packer brass that he could’ve done this for their team had they listened to him and acquired such free agents as Randy Moss, who instead ended up in New England, and not showing off his rear end again in Lambeau Field. But this isn’t why I was relieved. I was relieved because it became painful watching him take brutal hit after crushing blow. I didn’t want him to win the game, but I also didn’t want to see him possibly close his career by being carried off the field and not being able to return. Regardless of what jersey he was wearing all fans of professional football want to see their stars play at the top of their game and retire at that same time. No one, including Packer fans wanted to see Brett take one critical blow that would send the iron man permanently to the sidelines. Now the season is over and the “R” word will repeatedly come up. Should he or shouldn’t he? For Brett’s sake I hope this is the end. He has proven he can still play and the Packers may have made a mistake…although Packer issues aren’t with the play of the QB…and with the proper supporting cast he can still take a team to play at the highest level possible. But as he did in his last play with the Packers, he also threw an interception to possibly end his career. But this time it is different. I would be relieved to not hear the constant retirement talk and relieved to know he is able to walk off the field to end his career. 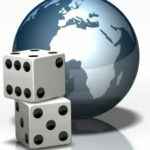 Be sure to check out all of Matthew’s stories at Engy’s.